Are you a passionate leader with a belief in people who can take our thriving small charity to the next stage of professionalism and growth? The founding Director of Alternatives, Julia Acott, is stepping down after 25 years and the Trustees are looking for an exceptional leader who will embrace the inclusive ethos of the charity and take it to the next stage of growth, diversifying income to ensure sustainability. This post is funded by Tudor Trust for three years. You can access the job description and apply for this post through CharityJob. The deadline for application is 5pm Friday 1 March with interviews in the week beginning 25 March. This is a full time post (35 hours/week) ideally starting in the summer of 2019 and the salary is: £36,400 p.a. plus 3% pension. An enhanced DBS check is required for this post. 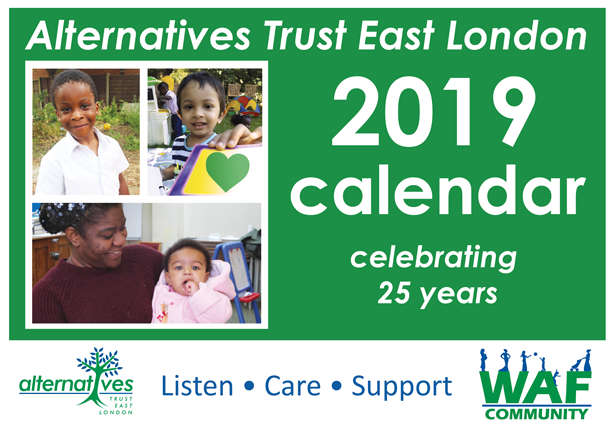 Alternatives Trust East London (Alternatives) has a strong commitment to achieving equality of opportunity in both services to the community and the employment of people. No applicant or employee will receive less favourable treatment on the grounds of race, colour, age, religious beliefs, nationality, ethnic or national origin, gender, sexuality, marital status, family responsibility or disability, or be disadvantaged by conditions or requirements that cannot be shown to be justifiable. Click Here to purchase your calendar online now! Alternatively, speak to one of the Alternative staff members to buy your calendar in person with cash and save on postage costs. Are you a Swimmer? Do you like a challenge?